School-based sports teams benefit from Learning Breakthrough Program™ use in very important ways. Academic performance improves in students who use the program properly and consistently in the same way it does for all academically-minded users. 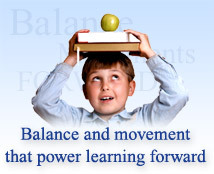 Athletic ability will improve due to the nature of the balance training components inherent in the program's activities. Injury reduction is also noticed because of the proprioceptive skills development inherent to the program. For as little as 15 minutes, preferably two times each day, scholastic athletes can improve in all these areas. In competition, the difference between victory and defeat is often very small. If you are an athlete or a coach, then your priority is maximizing the talent that you have. The Learning Breakthrough Program™ will provide you with the tools you need to gain the edge that helps you win. There are certain characteristics that all successful athletes have: the ability to evaluate information and make the right decision quickly, excellent balance and control of their bodies, good timing, the ability to execute quick, precise movements and excellent peripheral vision. All of these processes are dependent on keen visual function and superior proprioception. (Proprioception can be defined as the awareness of movement and body position combined with the psycho-motor control necessary to execute the brain's instructions to the body.) It is sometimes also defined as the body’s joint positioning system. Effective proprioceptive processes are dependent upon the ability of the brain to integrate information from all of the sensory systems including feedback from muscles and joints, vision, the tactile sense (touch/pressure), and the sense of balance (vestibular system). The difference between a good athlete and a great athlete is often quite small. But small improvements in performance often require huge improvements in brain efficiency (neural network processing.) For example, if a person throws a ball to a target at four meters distance, the release window for the ball leaving the hand is eleven-one-thousandths of a second. If the same target is moved to eight meters distance the release window decreases to one-quarter of one-thousandth of a second. The brain requires 64 times as many neurons to fire at precisely the right time to hit the target at eight meters as it does at four meters. It becomes immediately apparent that in order for an athlete to perform at higher levels, he or she must be able to develop increasingly larger and more efficient neural networks. The question is: how can an athlete improve the neural efficiency of the brain? The difficulty level of Learning Breakthrough training products can be adjusted to challenge any athlete. By increasing the difficultly level of the activities, the brain is forced to develop more advanced, efficient neural networks. As neural efficiency improves, performance increases. The Learning Breakthrough Program offers you a new way to maximize your own performance or the performance of your team. It will help you to play smarter, reduce injuries, and improve efficiency. An additional benefit of program use is that because it improves neural efficiency generally, it not only improves performance on the field, it powerfully aids in academic performance. This can help players meet their academic minimums and improve graduation rates. To learn more about how and why the Learning Breakthrough Program can improve the basic foundations of the human body and the mind, click here. To read about others’ success stories with the Learning Breakthrough Program, click here.